Also known as an Air Ace or Flying Ace, these pilots became heroes and celebrities during the First World War. Technically, an ace was a military pilot credited with five or more kills. The first recognised ace was French pilot Adolphe Pégoud, but probably the most famous ace was Manfred von Richthofen - better known as the Red Baron. 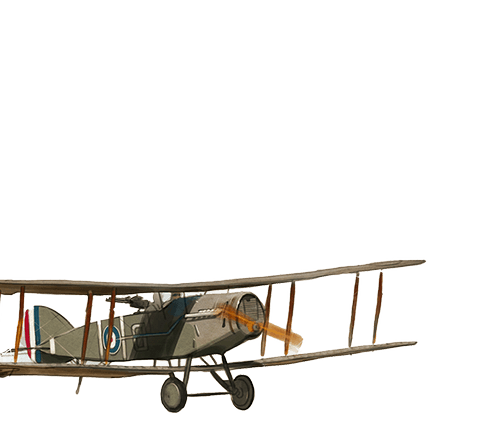 Bloody April refers to the air battles fought over Arras in April 1917 between the Royal Flying Corps and the German Air Force, the Luftstreitkräfte. Out of the 365 aircraft gathered, the British lost 245, with 211 aircrew killed or missing. In comparison, the Germans recorded 66 aircraft lost. Mining operations consisting of tunnels and galleries dug under or alongside enemy positions for the purpose of placing explosives. An aerial fight between military pilots involving speed and manoeuvre. A steel dart that can be thrown, dropped, or fired at an enemy, causing severe injury or death. The nickname of Jagdgeschwader 1, a fighter unit of the German Air Force commanded by Baron Manfred von Richthofen. The Flying Circus got their nickname due to the bright colours of their aircraft and their frequent travel around Europe to different airfields - like a travelling circus. A First World War long-range heavy bomber built for and operated by the German Air Force. The Gotha was used mainly for night missions, carrying up to 14 25 kg bombs and was armed with up to three machine guns for defence against scouts or fighters. A transport system similar to trams, involving the transportation of lighter loads at a faster rate. Often used for transporting people in urban centres, light rail was used extensively during the First World War to transport people, supplies, and ammunition both above and below ground. A slang word simply meaning ‘reconnaissance’ or ‘reconnoitre’, a recce is a survey of a location by an individual or group to obtain information. A prolonged battle where an army fights an enemy who are defending a static position. Siege warfare often involves a high level of creativity where innovative tactics and new weapons are trialled, with each side looking to gain the advantage. An essential part of an army’s operations and logistics, a supply column carries everything that an army needs to sustain fighting, advancing, or retreating. This includes food, ammunition, weapons, medical equipment, clothing, and other necessary items. (Army) Usually made up of two or more troops, a squadron is a counterpart to an artillery battery or infantry company. (Air force) A squadron is a military air unit consisting of 12 to 24 planes. Manfred von Richthofen was a German fighter ace during the First World War and commander of Jagdgeschwader 1, also known as the ‘Flying Circus’. Named the ‘Red Baron’ after his bright red Fokker Dr.I triplane, Richthofen was known for his skill in the air and successful tactics in engaging the enemy. Shot down and killed over Amiens, France, in April 1918, Richthofen was buried with full military honors by the Allies. He was credited with 80 victories and is arguably the best known ace in history. Sébastien Le Prestre de Vauban (1633-1707) was a Marshal of France and the most skilled engineer of his time. Vauban became famous for designing complex fortifications and was an expert in building and defending structures, as well as besieging them. Advising Louis XIV, Vauban designed and oversaw the construction of France’s border fortifications during the 17th century. Zeppelin airships were developed in Germany by Count Ferdinand von Zeppelin in the 1890s and first put to commercial use in 1910. During the First World War, Germany used Zeppelins for reconnaissance and bombing raids.